yesterday we looked at the rich history of Coco Chanel’s life and the creation of her fashion empire. it all began with a small hat shop in Paris, and today, the Chanel brand is one of the most recognizable in the world. since Karl Lagerfeld’s introduction as the company’s creative director in 1983, the brand has remained timeless, elegant, and yet always at the forefront of our fashion minds. 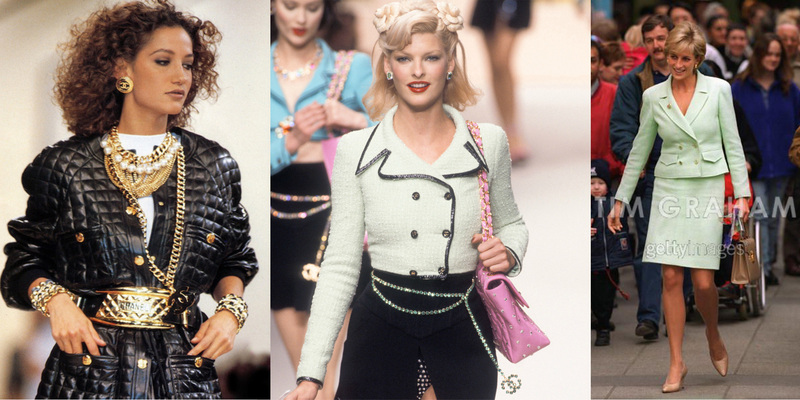 the Chanel style played a significant role in the 1980s, 1990s, and still today. throughout the 1980s, the Chanel brand launched new fragrances, including their first for men, Egoiste, which emerged in 1990. they continued their tradition of elegant and timeless pieces for women, and their two piece suits were a huge hit in the decade where boxy blazers and chic business attire was all the rage. opulence was the word in the 1980s, and the Chanel lines had fun with the trend; paying homage to Coco’s layered pearl necklace look, the brand showed no fear when it came to accessories; their chain-adorned bags, gold logo-enhanced pieces, and color blocked pieces fit perfectly in with the trend- and dare we say, even worked as a catalyst for it. the 1990s (a personal favorite fashion era) were the antithesis to the extreme styles of the 1980s; where there were shoulder pads and blazers, we now saw lingerie-inspired dresses; where there were bold, neon colors, we now saw black, white, and gray. 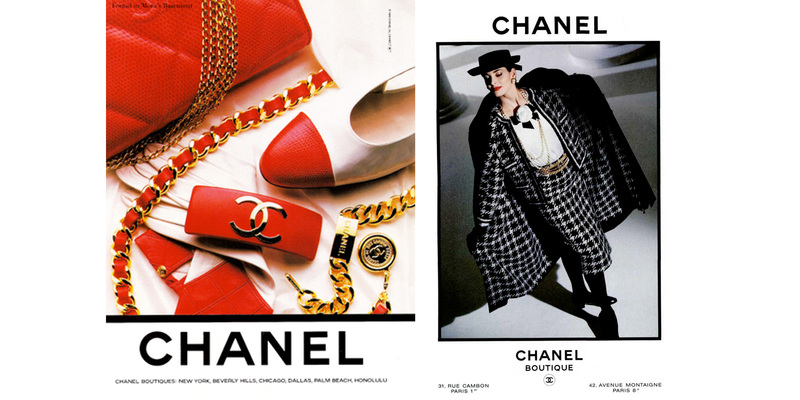 luckily for Chanel, the fashion chameleon easily worked it’s way into the styles of the 1990s, while again remaining true to the brand’s style. a fine jewelry line was introduced in 1993, bringing the elegance of the Chanel look to another area of style. our favorite celebrities and models were our favorite fashion inspirations in the 1990s, and iconic Chanel looks were often seen being sported by our favorite women. chanel’s 1991 autumn/winter collection featured on-trend layers of glamorous chains, paired with Chanel’s classic black and white palette and their signature quilted fabrics. in 1995 Karl and the Chanel crew took on the candy colored pastels trend, yet still managed to keep a classic look with black piping, chic feminine silhouettes, and a colorful take on their classic handbag. princess diana was oh-so-chic in 1997, sporting a pale green Chanel suit that perfectly combined a classic style with a modern color and cut, at a hospital benefit in London. the 2000s have shown a series of gorgeous, innovative, yet classically Chanel collections. Chanel’s collections always manage to perfectly capture of the moment trends- colors, accessories, details- and blend it into an elegant look that would make Coco proud. (from top left) 1920s-inspired dropped waists and LBDs in the fall 2005 show. sheer, gathered layers are perfectly accessorized by layered sparkling necklaces in the spring 2006 RTW show. glamour, monochromatic elegance, and a classically Chanel silhouette in the fall 2007 couture show. sparkle-adorned flapper chic gowns in the spring 2008 couture show. oversized accessories and 19th century inspired empire waists in the spring 2009 show. classic Chanel suits in jewel toned woolens with on-trend fur boots in the fall 210 RTW show. goddess-inspired flowing gowns with Chanel’s signature dropped waists, in soft pastels, in the spring 2011 couture show. chic grays and feminine bows on the classic suit in the spring 2012 couture chow. layers of nubby knits in soft pastels and a decidedly Chanel silhouette in the 2013 pre-fall show. an equestrian vibe meets the classic Chanel suit in the fabulously over the top Dallas-hosted 2014 pre-fall show. Categories: inspiration | Tags: chanel, couture, lagerfeld, paris, princess diana, runway | Permalink. she was the woman who created modern fashion. 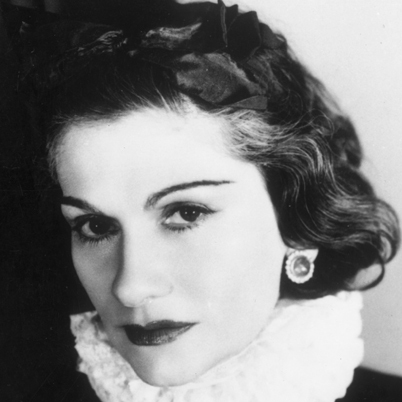 a spectacular designer, a brilliant artist, and an intelligent businesswoman, Gabrielle “Coco” Chanel was born in france in 1883, and opened her first shop in paris in 1910, where the fashion elite flocked for her gorgeous hats. but the real draw was Coco’s personal style; in a time where flamboyant women’s dress of the 19th century began making room for a more chic, simpler fashion that was much less fussy and much more fresh and modern. Coco’s simple, neutral, and chic wardrobe fit the bill perfectly, and before long her customers demanded clothing that mirrored hers. by 1913 she opened her second shop, where she introduced her sportswear collection, and from there, her business took off. 1921 saw the creation of her iconic No 5 fragrance, and in 1924 she launched her cosmetics line. by 1931 her popularity spread to the states, where she was invited by MGM to create costumes for some of their biggest stars. by 1954, when a new wave of fashion silhouettes had taken over, Coco revitalized her brand, while remaining true to her classic shapes and styles, and the next generation became inspired once again by her elegant, classic, yet refreshing designs. she created fashion breakthroughs, from her leather purses with chain detailing, two tone shoes, and her classic black and white ensembles, including the little black dress. in 1971 the fashion icon died, but her business continued to thrive. from the launch of the brand’s ready to wear collection in 1978 to the appointing of Karl Lagerfeld in 1983 as creative director of all Chanel fashion lines, the brand continued to make fashion headlines throughout the 20th century. tomorrow we will visit the Chanel brand today, and their amazing fashions that continue to inspire and awe. Categories: inspiration | Tags: chanel no 5, coco chanel, couture, fashion, karl lagerfeld, little black dress, paris | Permalink.